The princess flower plant, also known as lasiandra and purple glory bush, is an exotic shrub sometimes reaching the size of a small tree. 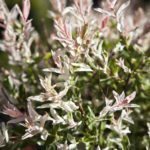 When growing princess flower shrubs in the landscape, you’ll find they quickly reach a height of 7 feet and higher and may reach a spread just as wide. Care of princess flower is easy and uncomplicated. Large purple flowers that attract hummingbirds and butterflies to the garden all season long bloom in abundance from May through freezing weather. 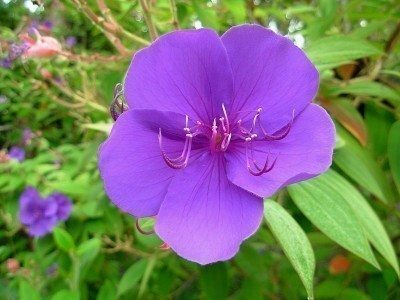 Botanically called Tibouchina urvilleana, blooms will appear throughout the year on the princess flower plant, with heaviest flowering from late spring and on into winter in tropical areas. Hardy in USDA Zones 9-11, allow plenty of room when planting princess flower. If you’re already growing princess flower and find it is becoming overcrowded, pruning is appropriate. In fact, heavy pruning as part of the care of princess flower does not deter the abundant blooms of this plant. Prune in early spring to control growth. Otherwise, trim the plant as needed to keep it tidy. Princess flower bushes that are not pruned usually develop a rounded form with age, but may take on a sprawling habit if pruned once and then not maintained. One note of caution: the plant spreads by suckers and can be rambunctious. It has escaped cultivation in Hawaii and is considered a noxious weed. If this is a concern, containers are a good option for preventing spread. Additionally, as the multiple stems are thin and vine-like, princess flower bush is a good candidate for a trellis. When you’re planning to grow princess flower in your landscape, choose a spot where it will be appreciated for yearly evergreen foliage and an attractive, upright habit. Site the plant in moist, well-drained soil that has been amended with manure, compost or other organic material. Plant the princess flower bush in a full to partially sunny location. In the hottest areas, this specimen prefers afternoon shade. The princess flower plant needs regular watering to keep the soil evenly moist, particularly during hot spells in summer, but don’t allow the soil to become soggy. Although princess flower is relatively drought-tolerant, it will bloom better with sufficient moisture. Fertilize every spring with a product formulated for azalea, rhododendronand other acid-loving plants. Reapply fertilizer in summer and autumn. Remove blooms as soon as they wilt to encourage continued blooming. Spread a little manure or compost around the plant every spring, as the plant thrives in rich soil. Also, mulch the area heavily to retain moisture, control weeds, and keep the roots cool. Tibouchina is relatively pest-resistant, but watch for mealybugs and aphids. Both are easy to control with insecticidal soap spray. Those living in Zone 8 may grow the princess flower plant, but expect the shrub to die back if freezing temperatures occur in winter. The princess flower bush usually recovers the following season to produce more of the brilliantly colored purple blooms. That said, Tibouchina is well suited for containers, so this is a good solution if you live in a cold climate; just bring the plant indoors before temperatures drop in autumn. Princess flower bushes are easily multiplied from cuttings that can be overwintered in a greenhouse, or even indoors as a houseplant. In fact, don’t be surprised to see a few purple blooms on the princess flower plant indoors when it is happily located in a sunny window. Read more articles about Princess Flower Bush.